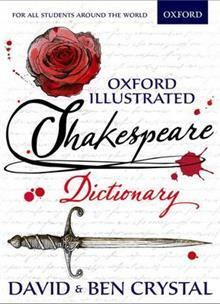 The Oxford Illustrated Shakespeare Dictionary is a brand new, unique, alphabetical colour dictionary of Shakespearean words and meanings, targeted to help students of 11-16 years get a better understanding of Shakespeare anywhere in the world. Ideal for GCSE and for all who love ... read full description below. The Oxford Illustrated Shakespeare Dictionary is the first of its kind, a brand new illustrated alphabetical dictionary of all the words and meanings students of Shakespeare need to know. Every word has an example sentence selected from the twelve most studied plays including Macbeth, Hamlet, Romeo and Juliet, A Midsummer Night's Dream, and Henry V. Usage notes and theatre notes provide additional background to Shakespearean times and the performance of his plays. Further support is provided by language panels on select topics like the humours, swearing, and stage directions, and full-colour illustrated thematic spreads on special feature topics from clothes and armour to music and recreation. The dictionary is easy to use with its clear signposting, accessible design, and expertly levelled contemporary look and feel. It is the perfect support for a full understanding of Shakespeare, created by renowned authors Professor David Crystal and actor Ben Crystal, a father and son team who combine for the first time the academic and the theatre, bringing together language, literature, and lexicography in this unique Shakespeare dictionary of global appeal. David Crystal, well-known writer, editor, lecturer and broadcaster on the English language, is also honorary professor of linguistics at the University of Bangor. Among his many books are Think on my Words: Exploring Shakespeare's Language, (with his son Ben) Shakespeare's Words and The Shakespeare Miscellany and (with his wife Hilary) Wordsmiths and Warriors: the English-language Tourist's Guide to Britain. He was Sam Wanamaker Fellow at Shakespeare's Globe in 2003-4 and received an OBE for services to the English language. Ben Crystal is an actor, writer and producer. Along with books co-written with his father, he wrote a series of introductions to Shakespeare's plays for Arden called Springboard Shakespeare and his Shakespeare on Toast was shortlisted for the Educational Writer of the Year Award. He and his ensemble perform Shakespeare in original pronunciation - a first reading of Macbeth in OP was in the Sam Wanamaker Playhouse at Shakespeare's Globe - and give workshops around the world.